This monthly e-newsletter, written by the editors of Sensors & Transducers Magazine (ISSN 1726-5479), delivers the product and research news you asked for, and updates you on happenings in the sensor science and industry. Who should read this Newsletter ? All who are interested in the newest information and trends in sensors, transducers, MEMS and sensor instrumentation, including DAQ. The deadline for articles, press releases and sponsored White Papers for the next issue of S&T Journal (e-Digest) No.6, Vol.105, June 2009 is 16 June 2009. You can submit your article or press release online. For more information and instructions of preparation click <here>. The worldwide image sensor market currently involves over 11 billion devices with a market value of over $7.5 billion. After a short period of downturn, the market is forecast to pick up steam by 2012 and exhibit robust growth rates through to 2014. The Future of Image Sensors provides five-year market forecasts for image sensors broken down by end-use application, region and device type. The report provides market forecasts for the period 2008-14 and details key technologies, end-use sectors, geographic markets and company activity. This report is designed to help those in the image sensor business meet today's challenges as well as plan for the next upswing in demand. Natick, Massachusetts – Electronic pressure-sensing devices that employed variable capacitance-sensing technology continue to dominate process applications. According to recent research from VDC Research Group, in 2008 45.7% of electronic pressure-sensing devices were of variable capacitance-sensing technology, and this percentage share is expected to continue to grow steadily at a rate of 2.6% per year through 2013. “Electronic pressure transmitters and transducers that operate on variable capacitance-sensing technology use relatively little current, which make these ideally suited for battery-powered operations,” the study notes. Resonant solid state, silicon-on-insulator and diffused/ion-implanted piezoresistive-sensing technologies were also widely implemented in 2008 and are forecast to account for a major share of the worldwide electronic pressure transmitter market in 2013. “Along with pressure range and sensitivity, common criteria that are considered important during sensor selection for a given application are physical size, cost, accuracy, temperature performance, reliability, long-term stability, and media compatibility,” added VDC Research’s Tim Shea. 1) To subscribe, update your address, renew subscription, pass the Newsletter along to a friend or have them subscribe click <here> or send e-mail. At Sensors Web Portal, we take great care with your personal information. We value your privacy and your time. We will never sell, rent or otherwise share your email address or any other contact information you provide us without your express permission. 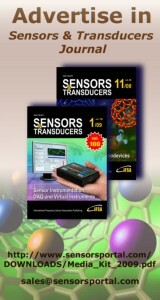 2) Would you like subscribe our Sensors Industry News Feed (http://www.sensorsportal.com/sensors.rss) or add it into your blog ?